The other day I was rudely awakened by the sound of a downpour of rain coming in through my open bedroom window. In the resulting scramble to get it closed, I nearly killed myself by running straight into some of the teetering stacks of books and magazines that were piled on the floor. Down tumbled paperbacks and hardcovers, my bare feet sliding under the glossy magazine covers. Cursing, I slammed the window closed and surveyed the damage around my ankles. It was 3am and the last thing I wanted to do was rebuild the precarious piles my books had stood in. A scary, foreign thought entered my mind. "Seriously, why don't you just get an e-reader already?" the traitorous voice said. As I looked down at the literary carnage at my feet, I couldn't help but start to agree with the evil, demon voice born from bruised toes and torn pages. I always said I would never get an e-reader. 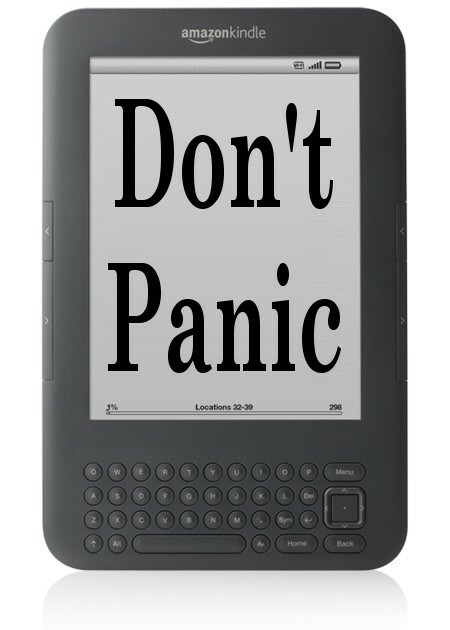 The unnatural technology of e-ink, of Kindles and Nooks, was at odds with my book-loving ways. They didn't have the wonderful fresh smell of new books, or the more rich aroma of older tomes. They weren't tactile. Reading a book is the most natural thing in my life. Holding a thin hunk of plastic instead? Not so much. You can't cuddle up in bed with an e-reader, you can't take it in the bath. You can't even loan it to a friend and then spend a solid month calling them to ask for it's return. E-readers lacked souls. I am by no means a luddite (I have my iPhone basically grafted to my hand) but there was something about e-readers that turned my stomach and made me feel uneasy. This was the future of books? All those beautiful paper books replaced by sad gray tablets? I railed against them and swore never to purchase one, but at 3am the prospect of having one neat machine to keep hundreds of books in it seemed like a good idea. At first, I blamed it on sleep deprivation. The raving thoughts of a lunatic at 3am. An e-reader? Me? The consummate book collector? I grew up and libraries and bookstores. My first job was in a library. I worked in a bookstore for many years. I felt like I was betraying some kind of religious dogma. An e-reader? Me? I've been researching the machines and I'm not yet sold. Impressive technology, something straight out of a sci-fi novel, yet still lacking warmth and soul. I slowly tried to understand them. I downloaded e-reader aps for my iPhone and then nearly had an aneurysm trying to read on them. I couldn't get over the loss of turning pages. In my quest for understanding, there were lunch hours spent at Barnes & Noble trying to get used to the Nook. There were trips to Target that involved glancing worriedly at the Kindle on display. As I went deeper down the rabbit hole, I found myself appalled at the technology. I actually swore out loud when I read you could not loan e-books, even if you had bought them. The rules around e-books were increasingly Draconian. Amazon could delete them from your device (like they did with 1984 in 2010 after a copywrite issue) or the publishers could jack up the price to nearly what a paper book cost. I have shelved my ideas for getting an e-reader for now. The technology isn't there yet, as far as I'm concerned. The idealized version of e-readers that sci-fi has given me, like the Primer in Neal Stephenson's Diamond Age or the Guide from Douglas Adam's seminal Hitchhicker's series, are still very far away. One day I'll be ready for an e-reader... for now you can pry my paperbacks out of my cold dead hands. I'll just have to deal with bruises on my toes. I love books. Towering heaps or neatly arranged shelves vanishing off into infinity, populated by Eleanor Twitty, Vashta Nerada, and Necronomicons will always have a place for me. But I don't want to read them. You can curl up with them in bed, and you can take them into the bath (ingredients: one ziplock freezer bag). As someone who was on your side of the fence until my sister bought be a kindle as a christmas present in 2010, I respectfully disagree. I actually wrote a rebuttal to this sort of argument as an editorial but I'm afraid to post it here because it's extremely tongue-in-cheek. As in, I'm purposely more insulting than I need to be, but it was written as a joke to another writer who I banter with often. Either way, good luck, and I sincerely hope you join our side of the isle someday. I suspect you won't regret it. But if you don't, at least you're one of us few remaining who not only purchase the printed material but actually read it, rather than have it sit there and feign intellect. We're a dying breed, and the fact that this sort of argument sprouts up between the two camps shows that we bookworms all still have some kick in us. I am a Kindle lover (as my compelling argument on the main page shows), but even I concede that only early adopters can really be happy with the way things are right now for one reason - publishers haven't gotten their heads out of their nether regions. There are plenty of publishers who try to make ebook prices punitive, or do stupid crap with the release dates to try to 'force' us to buy physical books, and in some cases only 3 of 4 books in a series will be on the Kindle. In ten years, we'll all be laughing about how silly the early years were, just like with music before iTunes, but right now it's freakin' frustrating. I don't blame anyone who waits until that crap is sorted before jumping into the pool. For me it depends on what I am doing. If I am reading for pleasure I like books. I like the musty smell, I like the feel of the paper and I like physically turning the pages. I find the whole experience of reading a good book relaxing. But, if the reading is for academic work, either referencing a work or just reading the work, I am fine with an e-reader. The only time I could see that an e-reader could be better for my reading/pleasure books would be when travelling, and only because of weight limits. I love books, but I love my Nook too. There is nothing wrong with having and loving both. I like that I can have hundreds in one device and they are cheaper. But sometimes I just need to hold a book. And some books available for the Nook do have a "lend me" feature. @Sandra: You and I are complete opposites. I love the Kindle for casual reading but for books that I work from, I have to have the physical copy so I can mark it up and put post-its all over it.